Vance paid for it all — including a $4,780 round-trip flight to London and a $2,800 stay at a five-star Paris hotel — with money his office obtained from state asset forfeiture funds largely tied to big-sum legal settlements with banks, records show. He controls more than $600 million stemming from forfeitures. The Manhattan prosecutor far outspent the city’s other four district attorneys, the data reveals: Bronx district attorney Darcel Clark, who expensed $18,407 to cover travel to multiple conferences across the country since taking office on January 1, 2016, came in a distant second. Vance says his trips were necessary to attend conferences covering anti-terrorism, cybersecurity, and gun control, among other issues. 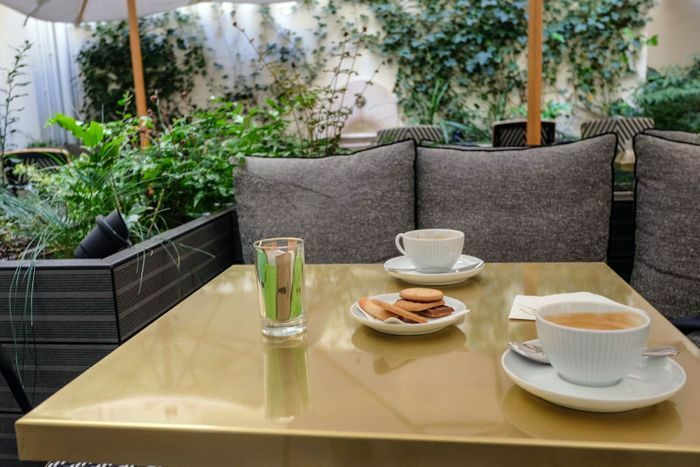 While in Paris, he spent four nights at Hôtel d’Aubusson, paying $2,816. 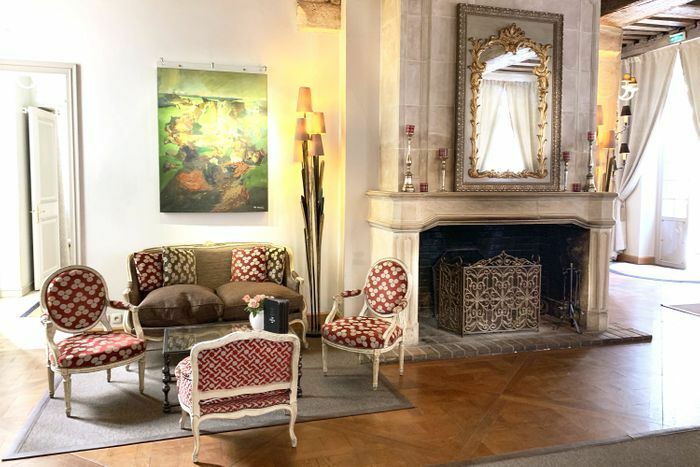 The five-star hotel “is housed in a true Parisian mansion dating back to 1634” and boasts “discrete [sic] luxury, Louis XV furniture, original Aubusson tapestries and a wonderful wood burning fireplace,” according to a description posted on TripAdvisor. The prosecutor’s most expensive flight last year was a $4,780 “discounted upper class” round-trip ticket on Virgin Atlantic to London to attend the Ditchley Foundation Conference on Policing, chaired by the London police commissioner, from January 24, 2018 to January 27, 2018, expense reports reveal. Round-trip New York-to-London flights run an average of $675, according to faredetective.com, which tracks flight fees. In the summer, Vance rang up a $1,840 round-trip ticket on a premium economy Air France flight to Paris, to meet with the city’s top prosecutor and staff about “Counter Terrorism, Human Trafficking and Global Cyber Alliance” from August 22, 2017 to August 27, 2017, records show. 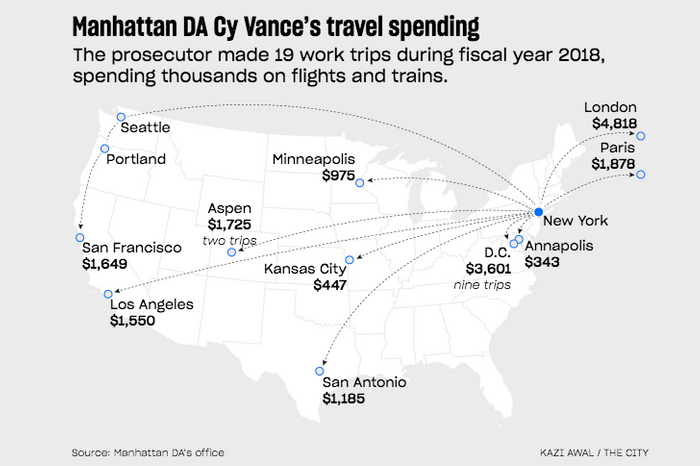 The prosecutor made 19 work trips during fiscal year 2018, spending thousands on flights and trains. For example, his administrative staff booked a round-trip ticket to Los Angeles five days before a conference there for $748 on Virgin America on April 25, 2017, expense reports show. He went to L.A. to participate in a panel discussion on “Solutions to America’s Underemployment Crisis” at the Milken Institute’s Global Conference. Vance also does not skimp when it comes to eating out — in New York or abroad, records reveal. He spent $645 at Patroon on East 46th Street to cover dinner with the Paris city prosecutor and four visiting French legal staff members on November 14, 2017, records show. 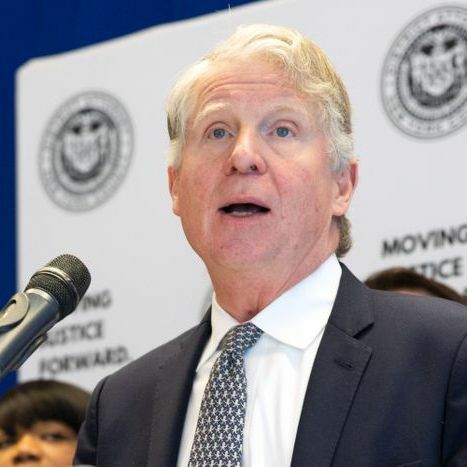 The 50 grantee organizations include the Legal Aid Society, Osborne Association, Prisoner Reentry Institute, NYC Department of Health and Mental Hygiene’s Health Justice Network, Global Cyber Alliance, and Saturday Night Lights. They include a probe with the City of London Police and the Royal Mounted Canadian Police that led to the arrest of six individuals in New York, London, and Canada charged in a cyber scam involving StubHub. Dunne also cited the case of Robert Depalo, a New York–based defendant, who defrauded UK-based investors out of $6.5 million through private offerings. Last summer, Depalo was convicted of grand larceny, money laundering, scheme to defraud, and securities fraud. This story was published in partnership with the nonprofit news organization THE CITY.